This entry was posted on April 5, 2018 by Chrissy Roos. Bar and Bat Mitzvahs are a very special celebration time for a family. It's the celebration of the coming of age for young boys and girls, so are certainly the best of occasions to rock a fun party dress! 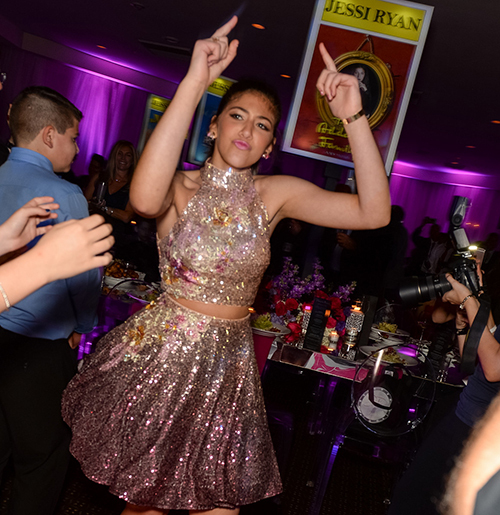 Jessi Kaplan, from South Florida, recently celebrated her Bat Mitzvah, and she did so in style. She rocked two gorgeous looks from RissyRoos.com to celebrate the special day: one for the Bat Mitzvah service and one for the party. Jessi's not the only gal of honor who rocked a Rissy Roo's dress at her Bat Mizvah, though - her mom, Randee, did, too! Check out what Jessie and Randee wore to celebrate the special day, and what Randee had to say about the looks, below. "I just wanted to thank you so much again for all of your help with the dresses for Jessi’s Bat Mitzvah! If you get an influx of South Floridians ordering Bat Mitzvah dresses for kids and moms now, you’ll know why! I know a lot of people and everyone has been asking me where I got our dresses! Thanks again for everything! 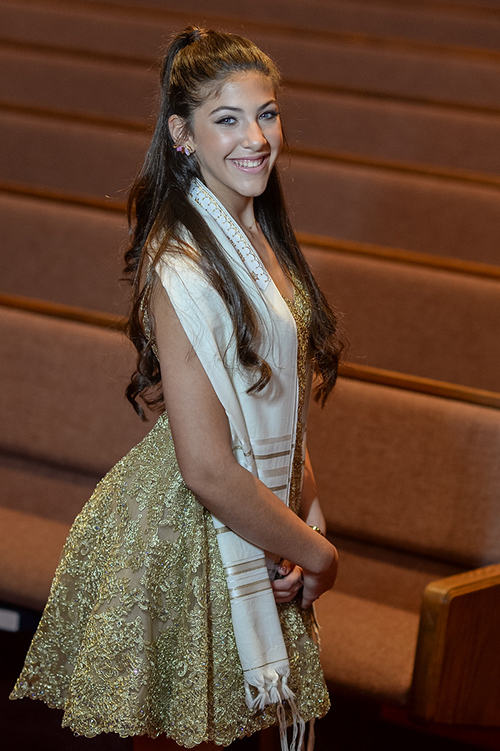 For Jessi's Bat Mitzvah service, Jessi wore Sherri Hill style 51521 in gold, a lace v-neck a-line dress. Sherri Hill 51521 features a sheer lace bodice, with a sweetheart neckline, opaque bra cups, lace tank straps, and an open square back, with a zipper closure. The beautiful short a-line skirt features an opaque underlay and scalloped hem. To top it all off, the entire dress is sprinkled with delicate jewels. Sherri Hill 51521 was the perfect choice for a glamorous look that's still conservative enough for a Bat Mitzvah service. Plus, the gold of the Sherri Hill dress perfectly matched Jessi's talit. 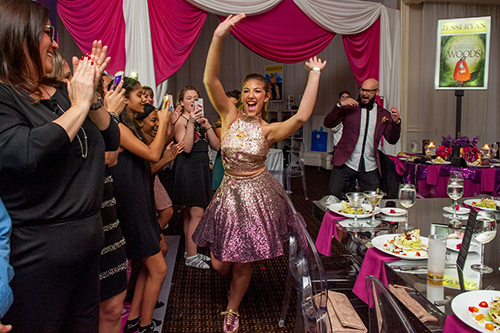 When it was time to celebrate the special day during Jessi's Bat Mitzvah party, Jessi went full-on glam! She wore JVN by Jovani style JVN54472, a shimmering two-piece party dress. Jovani JVN54472 is a colorful show-stopper dress that is covered in dazzling sequins and accented with a floral embroidered pattern on the crop top and on the hip of the skirt. The bodice has two on-trend features: a high neck and an open back. Our favorite part of this dress, though, is another trend - the ombre effect of sequins that gives it such a stand-out look! How cute are the pink knee-high socks that Jessi wore for her party? The socks are such a fun (and comfortable) touch! Jessi's mom, Randee, was dressed to impress for the Bat Mitzvah party, too. Randee also wore a Jovani dress to the party. She wore Jovani style 58646, but with a twist - she cut the floor-length gown to be a short dress! Check out the dress on our website to see it as a floor-length gown. It's a perfect choice for prom! Jovani 58646 blossoms with a floral print, made entirely of sequins, that couldn't be more gorgeous. The halter has a deep plunge neckline and halter straps, and the square back has lace-up corset details and a tie closure. 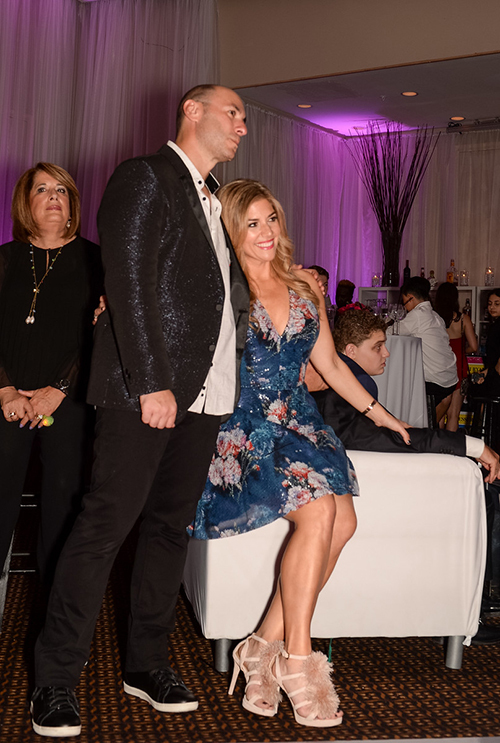 We love that Randee topped off her look with such fun floral high heels - it was the perfect touch to the Jovani dress! We're so glad to hear that Jessi and Randee had such a fun time at Jessi's Bat Mizvah and loved their dresses! Congratulations, and we hope you remember this special day for many, many years to come, Jessi!